Update: for the Saturday tours, please note that Lynchburg city streets are narrow and transportation will be by van rather than by bus. All tours have a 10 person minimum/13 person maximum limit per van. A second van for the local tours is dependent upon the minimum number. Additional transportation for the Charlottesville tour will be provided if the waiting list exceeds the minimum required. This guided walking tour of seven downtown churches includes Holy Cross Catholic Church (1879), Court Street Baptist Church (1879), First Baptist Church (1884), St. Paul’s Episcopal Church (1889), Eighth Street Baptist Church (1898), Court Street Methodist Church (1899), and First Unitarian Church (1925). On Saturday, October 14, three guided tours are offered for SESAH Conference participants. Please note that Lynchburg city streets are narrow and transportation will be by van rather than by bus. The tours have a 10 person minimum / 13 person maximum limit per van; a second van for each local tour is dependent upon the minimum number. This tour takes participants to the Old Court House, an iconic 1855 landmark at the top of Monument Terrace that now houses exhibits on Lynchburg history; Point of Honor, the 1815 Federal Style house that is a furnished period house museum; Rivermont House, a stately 1853 Greek Revival house that represents the highest level of private owner restoration; Vincent Kling’s unusual 1967 Houston Chapel at Randolph College; Old City Cemetery, one of the oldest public cemeteries (1806) in the United States that is now known for its gardens and interpretive historic buildings; Sandusky, the 1808 Federal Style house that is now interpreted as the 1864 Union Army headquarters during the battle of Lynchburg; and the Anne Spencer House and Garden, an extraordinary auto-biographical house and garden of this Harlem Renaissance poet and Civil Rights leader. This driving tour of the city’s six historic districts offers an overview of Lynchburg’s rich architectural history ranging from the early Nineteenth Century to the mid Twentieth Century and includes stops at the Old Court House History Museum and the Old City Cemetery. Note: Tour limited to 26 people. 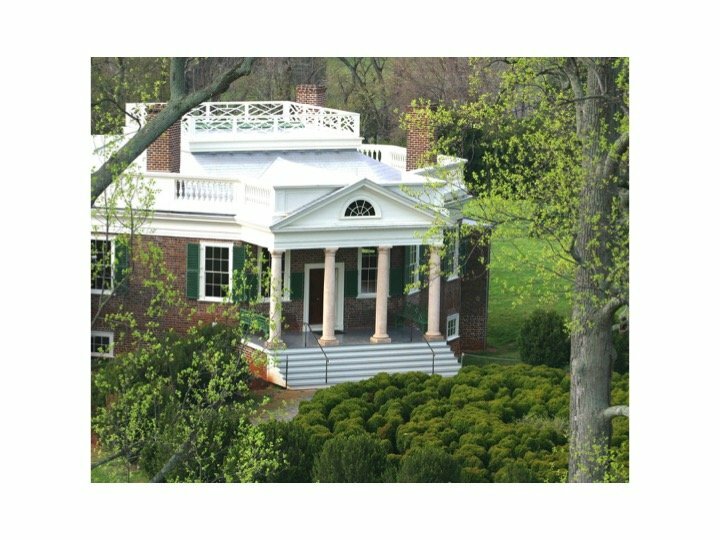 Participants will travel to Charlottesville to visit the University of Virginia and Monticello, both Jeffersonian essays in architecture that draw from classical ideals and contemporary Enlightenment philosophies. They are among the very few man-made works in the U.S. on the World Heritage List. Thomas Jefferson considered the founding of the University of Virginia, along with the Declaration of Independence and Virginia’s statute for religious freedom, his greatest achievements. Participants will tour the terraced green space embraced by red brick pavilions known as the Academical Village. At the north end of the lawn is the Rotunda, the original library, modeled on the Pantheon in Rome and built to half the scale. The Rotunda was recently reopened after a multi-year restoration of more than 50 million dollars. As recognizable as the iconic Rotunda is Monticello, Jefferson’s house just outside of Charlottesville. Monticello has recently undergone more restoration and interpretation of its outbuildings where enslaved workers lived and worked, and inside the house in Jefferson’s own suite of rooms. Seeing all three of Jefferson’s very personal works, Poplar Forest, Monticello, and UVA, allows for a more full understanding of how they are similar, and very different.